These are instructions for itslearning customers to set up ADFS for integration with itslearning's elogin component. Make sure the site is SSL enabled with commercial certificates. Attempts to use self signed certs have been unsuccessful. A site on itslearning which has eLogin enabled. The site must have users imported through IMS E, IMS ES or CSV, and they must have a SyncID in itslearning that correspond to a claim / attribute exposed via ADFS. Unless already done, you will have to obtain itslearning's metadata, and itslearning will need your metadata. Contact your itslearning consultant for assistance. All actions in this procedure must be carried out for for itslearning's test environment and production environment! Before entering production, a working configuration must have been validated in test. It is currently not possible for itslearning to subscribe to metadata to support dynamic changes, as ADFS metadata will have to be manually edited by itslearning's team of consultants to work. This means that if you change your ADFS configuration in a way that changes the metadata, you must contact your itslearning representative to have the change tested and implemented on itslearnings side! We firstly need to enable a trust relationship between the ADFS service and eLogin. In AD FS 2.0 Managemetn application, in the console tree, right-click the Trust Relationships -> Relying Party Trusts folder, and then click Add Relying Party Trust to start the Add Relying Party Trust Wizard. On the Select Data Source page, enter a URL to the metadata for elogin or browse to it on the local computer. Review the settings and click Next, and then Close. Right click on the relying party for elogin under Relying Party Part Trust. Under Advanced, make sure the Secure Hash Algorithim is correct. From R74, elogin supports both SHA-1 and SHA-256, but selected value needs to correspond to the secure hash algorithm specified in the elogin configuration. The Edit Claim Rules dialog box should already be open. 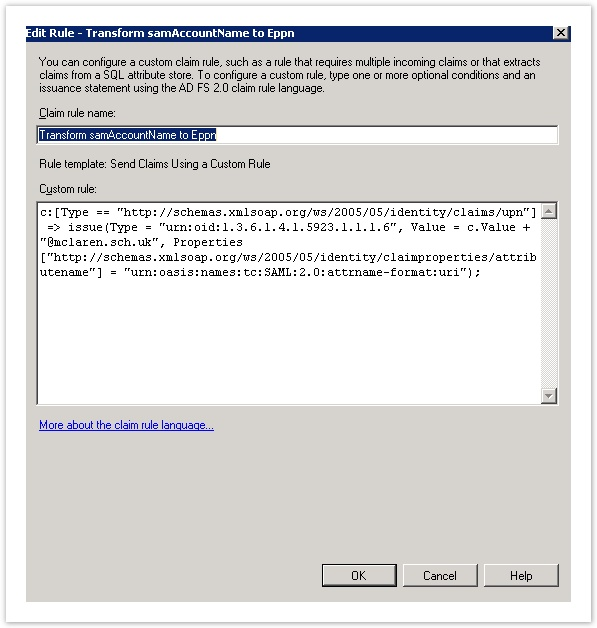 If not, In the ADFS 2.0 centre pane, under Relying Party Trusts, right-click elogin.mydomain.com, and then click Edit Claim Rules. 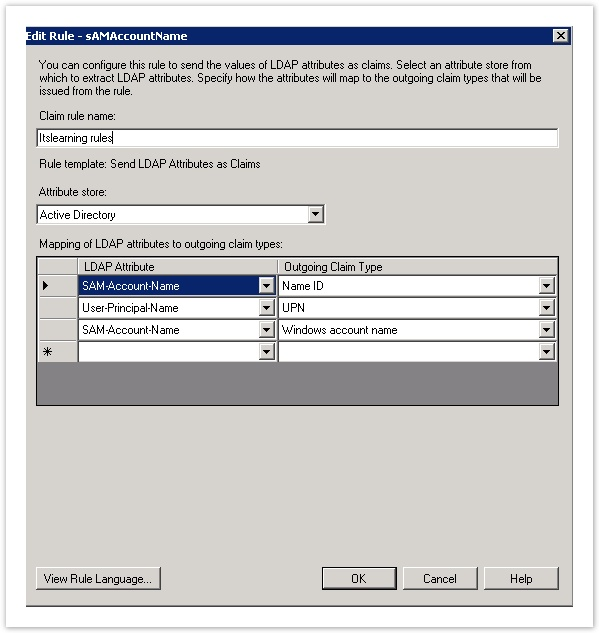 On the Select Rule Template page, select Send LDAP Attributes as Claims, and then click Next. On the Configure Rule page, in the Claim rule name box, type Get Data. Itslearning requires one attribute to be set as "NameID". This must be a value that uniquely identifies the user within Active Directory. In addition, there must be at least one other attribute issued. This attribute must uniquely identify the user in itslearning, and may be the same LDAP attribute as the "NameID"
In the event that there is no single field in AD that also exists in itslearning, it will in many cases be possible to create custom rules to transform attributes into something that has been imported to itslearning from the MIS. A common scenario is the use of eduPersonPrincipalName as an attribute imported from an MIS. This may not exist as a standalone attribute in Active Directory, but have in many cases been created in the MIS using sAMAccountName in Active Directory as a source. See http://technet.microsoft.com/en-us/library/ee913558%28v=ws.10%29.aspx for more information on the claim rule language. On the Select Rule Template page, select Send Claims Using a Custom Rule and click Next. In the above example, @mydomain.com is appended to the samAccountName to generate an ePPn of [email protected] This should be customised to individual customer requirements. (e.g. [email protected]). The object-identifier-style uniform resource name (URN) string urn:oid:1.3.6.1.4.1.5923.1.1.1.6 is the formal SAML 2.0 name for the eduPersonPrincipalName attribute—a name that the Shibboleth SP software understands by default.. Elogin also understands this from the web.config file. With this configuration, if a Windows PC is logged into the same domain as the Active Directory server, the user will already be authenticated to ADFS upon accessing an ADFS protected resource. Outside of the domain (e.g. from home) authentication will fall back to basic authentication. In order for seamless logins to work, the browser must trust the URI of the ADFS site (e.g. adfs.mydomain.com). The following changes need to be made depending on the browser that is utilized by the end user. Note: the below is only applicable when setting up the ADFS server for the first time - we can assume that the customer will already have this under control! 1.) Start the Management Console. 3.) For each of the Certificate Snap-Ins add the PFX certificate in to the Personal store. 5.) Within the security tab make sure full access is given to the NETWORK SERVICE account. 6.) Click OK and end all MMC snap in dialogues. Microsoft.IdentityServer.Web.RequestFailedException: MSIS7012: An error occurred while processing the request. Contact your administrator for details. ---> Microsoft.IdentityServer.Protocols.WSTrust.StsConnectionException: MSIS7004: An exception occurred while connecting to the federation service. The service endpoint URL 'net.tcp://localhost:1501/samlprotocol' may be incorrect or the service is not running. ---> System.ServiceModel.EndpointNotFoundException: There was no endpoint listening at net.tcp://localhost:1501/samlprotocol that could accept the message. This is often caused by an incorrect address or SOAP action. See InnerException, if present, for more details. The customer's original metadata file can be retrieved from https://adfs.customerdomain.tld/FederationMetadata/2007-06/FederationMetadata.xml or the customer can send it to you.